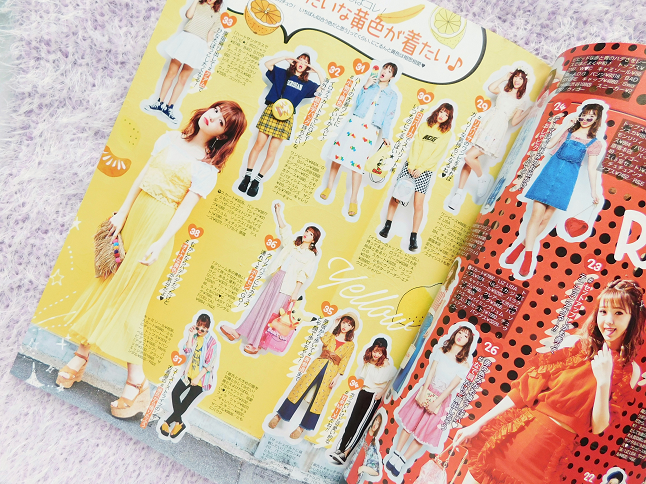 I haven't bought any Japanese fashion magazines in a while. I use to collect these magazines every month but stopped because these magazines aren't cheap if you buy monthly. Even though I can't read Japanese the pictures inspired me, you don't need to be able to understand a language to be inspired. Today I will be sharing my favorite pages from this issue. Hopefully, you guys will be inspired too! Popteen is one of my favorite magazines because it's completely my style, girly but somewhat trendy with a little bit of edginess. I love all the coordinates and beauty pages. 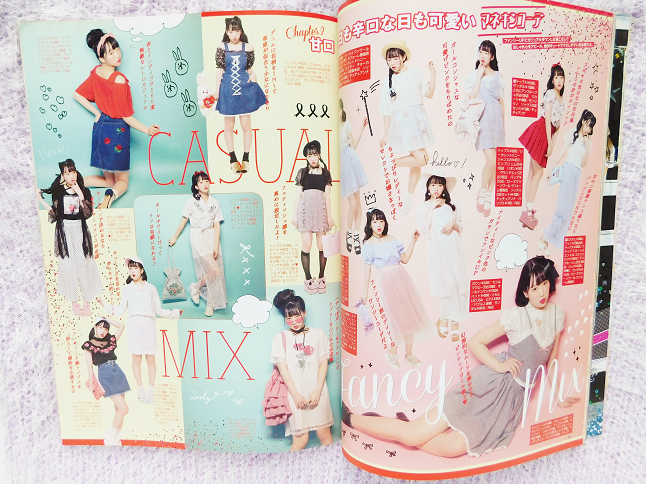 The colored scattered format of Popteen (and most Japanese magazines) is so fun, unlike the ones they sell in the US. The magazine came with some free gifts, a lippie stick and a 3-in-1 product. There is a whole page dedicated on how you can use this item but since I can't read Japanese I have no idea so I just guess based on the pictures. The lipgloss stick is a cute hot pink color but doesn't stay for too long. I think the 3-in-1 product can be used as a primer, cheek stain and lip gloss, it's no pigemented though just clear and waxy. What do you expect from free make up though? Michopa is my favorite Popteen model so I had to feature her outfit page. She's so pretty! This page is about facial massages. I wish I could read Japanese because they look really interesting.